Swaine’s project began in 2001 under the auspices of the “Generosity Project” for the California College of Art’s Wattis Institute. 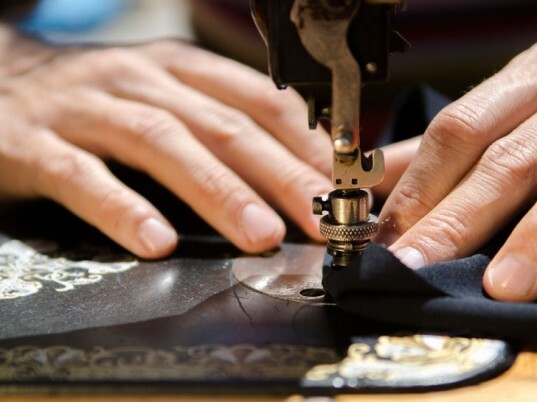 The lines of the original concept have blurred over the years, attracting not just people who need things repaired but also volunteers who sometimes take over with the sewing and mending. Swaine considers his setup an ongoing collaboration between himself and the community at large. There are also customers, many of them regulars, who like to stick around. For them, Swaine brings out chairs so they can linger. Sometimes people don’t need something darned so much as someone to talk to, he says. The term “mending,” he adds, can take on many meanings. Instead of the one-man performance piece he started with, Swaine now considers his setup an ongoing collaboration between himself and the community at large. Swaine has many of these life-changing partnerships. An analog designer with Futurefarmers since 1998, Swaine participates with many of the organization’s interdisciplinary projects, which range from fingerprint-based video games to a hand-drawn survey of Toronto’s city center. His work has been featured in exhibitions at New York City’s Cooper-Hewitt, National Design Museum, as well as San Francisco’s Museum of Craft and Folk Art and Exploratorium. The best kind of altruism - given freely by the provider. No government extortion of funding by 'do-gooders' desiring to spend others' earnings and who think they know better than the producers of the funds how those funds 'should' be spent on 'altruism'. I think he's fantastic, and inspiring! Such a wonderful idea and act of sharing. Thank you, Michael Swaine! This is so inspiring to me. I am trying to find a way to reach out in a new area. He has helped me to think differently about this. Thank you so much for sharing this. Thank you, Michael Swaine! If you like to see how others help others and others in very poor communities and even help prisoners in East Africa with Sewing and Knitting ....please search for ToolsToWork on Facebook Google and YouTube and watch Prisoners in action! A very great initiative and a real mind opener to many. There is a fellow that goes to the open markets in Mexico City that does this as his job, a traveling tailor so to say. I think Swaine is fantastic and his sharing and showing by doing I am sure has encouraged many. For readers that don't know the Tenderloin is one of the most down and out areas of SF. 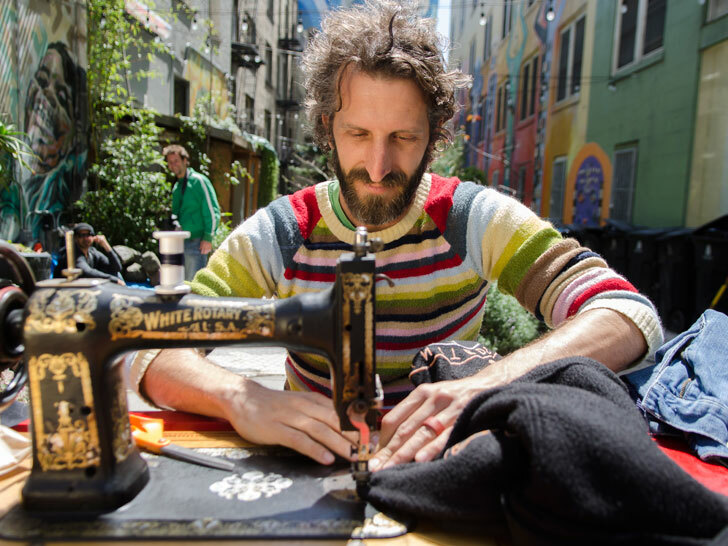 Sitting behind his makeshift "sewmobile" for the greater part of a decade, Swaine says he's been able to step out of his professional purview to create connections he otherwise wouldn't have. Swaine's project began in 2001 under the auspices of the "Generosity Project" for the California College of Art's Wattis Institute. 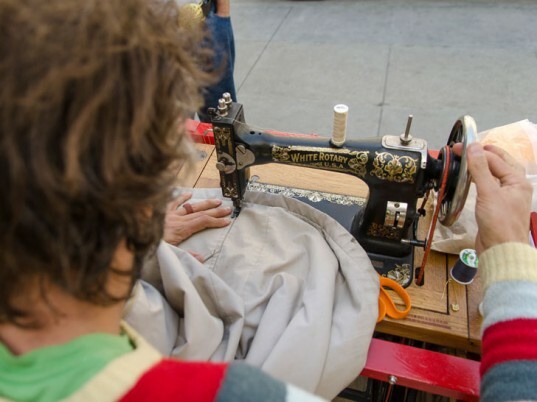 The lines of the original concept have blurred over the years, attracting not just people who need things repaired but also volunteers who sometimes take over with the sewing and mending. There are also customers, many of them regulars, who like to stick around. For them, Swaine brings out chairs so they can linger. Sometimes people don't need something darned so much as someone to talk to, he says. The term "mending," he adds, can take on many meanings.